These days, Macworld is much more than just a print magazine, but our print magazine is how we got our start, and our magazine is still read widely by people like you, our devoted readers. And a lot of hard work—by a lot of people—goes into producing that print magazine. Now we're proud to be able to share some of our behind-the-scenes work with you. To illustrate one part of the production cycle—the cover-making process—our contributing photographer, Peter Belanger, has made a very cool time-lapse video illustrating most of that process for our September 2009 issue. Peter approached me with the idea of trying to capture the cover process using time-lapse photography. It was impossible to show every step in the process (our cover meetings don’t make for great imagery), but the video does a nice job of capturing the bulk of the work it takes to make Macworld’s covers. The finished cover of the September 2009 issue. The cover-creation process is pretty involved. We have to decide on a compelling theme, discuss concepts, have those concepts approved, photograph hardware, get the photos touched up, design twelve initial cover variations, meet about those covers, design twelve more variations, and then pick our favorite. The cover then gets the final sign-off and is transmitted to the printers with the rest of the magazine. A few weeks later, we get a box of magazines in the mail. This whole process, excluding the time at the printer, takes more than 40 hours to complete. 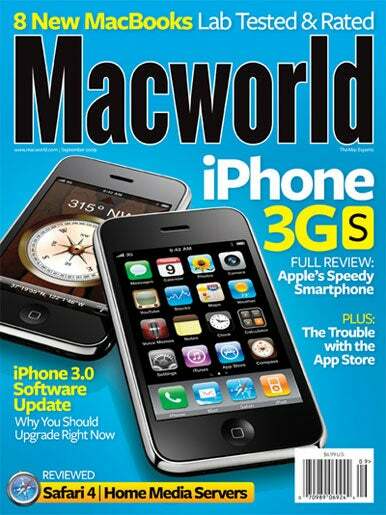 But it’s worth it, because that cover is what sells copies of Macworld on the newsstand. After working on the latest cover for Macworld magazine I wanted to show what is involved in making a cover. I focused on three main areas: the photography, Photoshop, and design. I chose a time-lapse format to convey lots of information in a small amount of time. The only drawback of time lapse is that since half a day goes by in 30 seconds, the whole process seems so easy! Lots of details were left out of the design process. The music was used with permission by The Brokenmusicbox. You can see more of their music at http://www.myspace.com/tbmb. We’d like to thank Peter for producing this special peek into life here at Macworld. And we’re especially happy to be able to share it with you, our readers.